Inder Loves Folk Art: Me-Made-May Part 2. Okay folks, I know we're already almost halfway into June (how the heck?) and I am working on other projects to share, but I do want to take a few moments to look at the second half of Me-Made-May (the first half is here) and my takeaways from the month. First Row: (1) Zinnia Skirt; (2) Bess Top; (3) Bess Top and Everyday Skirt; (4) Lisette B6182. Second Row: (1) Brumby Skirt and Maritime Top; (2) Plantain Top and Linden Sweatshirt; (3) Lark Tee, Manila Leggings, Linden Sweatshirt; (4) Unblogged cream linen sleeveless Archer shirt. 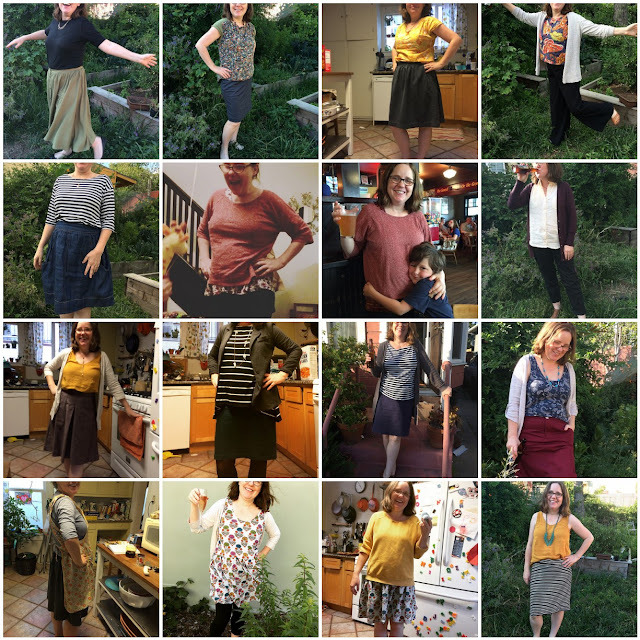 Third Row: (1) Lisette B6182 with unblogged gold rayon challis Eucalypt tank; (2) Mabel Skirt; (3) Maritime Top; (4) Plantain Tank and Moss Skirt. Fourth Row: (1) Plantain (hack) t-shirt, Everyday Skirt, Protect and Serve Apron; (2) Eucalypt Dress (shortened with elastic waist removed and sides taken in, removing pockets); (3) Linden Sweatshirt and Eucalypt Dress (again); (4) unblogged Eucalypt tank with unblogged Mabel Skirt. For the better part of the first half of May, I was battling a head cold and the weather alternated between somewhat chilly and downright freezing, so I wasn't feeling very enthused about dressing in me-mades or posing for photos every day, to say the least. All I wanted was to layer up in warm and stretchy clothes, cuddle under my electric throw blanket, and feel sorry for myself. The second half of May was definitely better - I was generally feeling more myself, and we had some gorgeous days towards the end of the month. It's amazing what a little sunshine can do! No shock, my favorite outfits of the month were mostly in the second half. I can basically never sew myself too many tops. My favorites are the t-shirts and the boxy rayon blouses, but I also really love my Archer shirts (despite the fact that they usually need ironing). My most comfortable skirts are the Brumby and the Moss. If I'm going to make more woven skirts, I should use those patterns. Contoured waistbands just feel more comfortable and flattering than flat waistbands right now. As much as I love my high-waisted skirts, they feel a bit constrictive on. I really love my Colette Mabel skirts, especially my stripey one. That was my third version of the pattern (never blogged), and I used wide elastic in the waist and a plain front in the longer length with the kick-pleat in the back. It's a killer skirt. It isn't quite as figure hugging as my seamed versions, and hangs away from my body in a really flattering way, while the elastic keeps the waistband where it should be. I believe I have completely debugged the Mabel for my body, and to celebrate, I bought some olive drab ponte for yet another version! I love my Maritime Top. Stripes are where it's at right now, and even though it's a little too big, it has a really cute, relaxed, boxy shape that looks good with everything. Need more. I pretty much live in my Linden Sweatshirts on the weekend. Another great pattern I've made three times. I have been meaning to try it as a simple t-shirt, I need to get on that! Although my Archer shirts are a bit of a pain to wear, because they require ironing, I feel really stylish when I'm wearing them. That pattern is a lot of work to sew, but I know I would wear more. I don't wear dresses very often, but I do like casual dresses for hot weekend days. Some of my favorite garments, mostly made last year, were never blogged! How did I not blog that really great sleeveless Archer and my frequently made stripey Mabel? Ugh! I regret that now, it is really great to have that record of my alterations and changes (as well as whatever else is happening in my life). I am determined to do better this year, even if it means some short and sweet posts. And finally, I really do wear and enjoy wearing so many me-made items! Sometimes sewing for myself can be frustrating - it takes longer and it can be harder to fit things. While it's easy to focus on the failures, it is good to remind myself of the many, many garments that have not only worked, but made their way into my regular rotation. For all you sewists who are intimidated by sewing for yourself, my suggestion is to pick a nice t-shirt, boxy blouse, or elastic waisted skirt pattern, and just try it out! You may be surprised! Did you participate in Me-Made-May? What was your number one takeaway? I loved following along with your Me Made May photos! We had similarly gross weather the first half of the month and I was so glad when things got brighter and warmer in the second half. My biggest takeaway was that I need more me made bottoms that aren't Hudsons/Luna pants. I have a bunch of patterns in my library and I need to put on my big girl pants and make them! That last outfit is so killer on you. I understand why you love the skirt so much, and it looks fab with the top! My biggest takeaway was that I was in dire need of more clothing, period. So I started working on that. My second was that, if I'm really going to wear me-made most of the time, I am going to have to sew some jeans. Yes, sew jeans, once you get the fit right you will never go back! Yep, skirt, top and cardi seems to be your perfect outfit! Like you, I've realised I could really use some more tops - for me, fitted long-sleeved t-shirts for layering. Pity I find them about the most boring thing to make.... My other takeaway from MMM was that I really wanted to try a Racer 5 IPA as featured in many of your posts, teehee! In fact Andy is in the US right now for work and I told him to seek one out! I really enjoyed seeing everyone else though and seeing what patterns look good on real bodies. I really like photos that are natural or at the end of the day. You really got a good look at how clothes drape over the day. I think my fav on you is that denim Brumby skirt, I love it! I need a denim skirt, for Summer, as part of my capsule. I am swinging between the Brumby and the Everyday skirt but I think I really like your Brumby. PS Sorry that was long. Very interested in the mods you made for your stripy mabel... looks great & like something I would like to wear! I love the last outfit so, so much! It looks incredible on you! I love your Eucalypt tank and that sleeveless Archer is awesome. You have some really awesome makes. Handmade items are hip right now. There are buyers and sellers aplenty who are looking for or trying to create that perfect and unique handmade item. Now is a fantastic time to start a sewing business that you can enjoy.